IASSC – Lean Six Sigma Green Belt Training - Cedars and Oaks Consults Ltd. This course is designed to ensure that you successfully obtain the Lean Six Sigma Green Belt Certification on your first attempt. This training provides in-depth knowledge in all aspects within the 5 phases, six sigma tools and standard principles of Lean Management with real life applications on various industry used cases. Green Belt qualification gives you the skills you need to tackle projects first-hand. You will be equipped with the tools and knowledge you need to run small, department-level projects independently, and to assist the Black Belt on larger, more complex problems within your place of work. A good understanding of Six Sigma concepts is an indispensable knowledge for today’s aspiring professional across any industry. If you are someone who wants to grow fast in your career using Six Sigma, then this is the course for you. Complete our Online Lean Six Sigma Green Belt Training to adequately prepare for the exam, gain certification and play a pivotal role in achieving operational excellence. Our Green Belt training is unrivalled and equips operational teams at the heart of Lean Six Sigma activity with the skills to drive real improvements. This course is comprised of professionally narrated e-Learning modules, interactive quizzes, tests and exams. All delivered through a system that you will have access to 24 hours a day, 7 days a week. This course includes well designed video tutorials, mentor support service, reading and study materials, online study platform, and forum. These facilities build your confidence to study efficiently and guide you to develop your skills and knowledge to prepare for the Six Sigma Green Belt Exam. Course Description This online Lean Six Sigma Green Belt Training course has been designed for 18 guided learning hours. Method of Assessment After you have familiarised yourself with the Six Sigma terminology, having a good understanding of 5 phases, successfully passed any mock exam you should be ready to take the real exam. All exams are available in English. IASSC Certified Green Belt exams are also available in French. Exam Preparation For those who wish to sit for the exam it is recommended, but not required, that Lean Six Sigma training is obtained through a qualified institution, Lean Six Sigma trainer or corporate program. 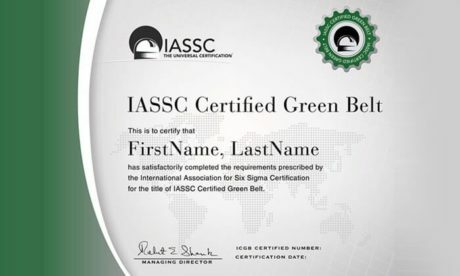 Certification Upon successful achievement, Professionals will receive a Certificate (IASSC Certified Green Belt (ICGB), suitable for framing, issued by the International Association for Six Sigma Certification or its designated Examination Institute, Peoplecert.